So our 6-year-old Whirlpool electric water heater tank failed and dribbled water on the floor. Fortunately, I spotted the leak before it flooded the basement: I look at the heater just about every time I venture into the Basement Laboratory Electronics Wing. Judging from the mildew & fungus growing on the wooden base I built for it, though, I haven’t been doing a good job of walk-by inspecting. In my defense, the visible wooden edge is 3/8″ thick below the dark rim of the heater. I turned off the inlet & outlet ball valves, flipped the breaker off, routed a garden hose out the door, laid the end in an old cake pan, and drained the tank. 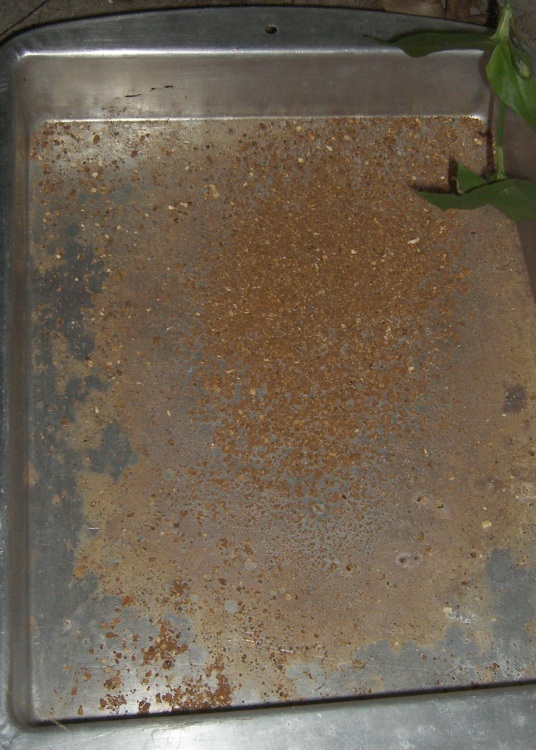 The pan collected a fair amount of rusty grit (and more washed down the driveway), which means the glass-lined tank was suffering from internal rust. My back of the envelope, confirmed by friends, is that it’d cost about $150 for a plumber to drop in. Oh, and this was on a Saturday morning, which means it might be a while later and bit more expensive than that. Paying somebody $75/hour to wait on hold didn’t seem attractive. A new heater of the same general nature is $400, give or take. Soooo, in round numbers, I’d be spending half the cost of the “free” replacement just to find out if Whirlpool would honor the warranty. Call the warranty line again, point out that this is the Internet Age, and offer to send them pictures of the problem, along with a statement that I was being truthful. Much to my astonishment, the pleasant voice gave me a replacement authorization! No pictures needed. So I hauled the corpse back to Lowe’s, swapped it out for a new one, and away I went. Now, it’s worth noting that the new heater has a 12-year tank warranty, not the lifetime one that came with the original purchase. Given my experience with the first one, we’ll see what happens; I suppose they learned how expensive a lifetime warranty can be. Overall, a pleasant surprise, although the initial presentation wasn’t encouraging in the least. This entry was posted on 2009-09-08, 07:54 and is filed under Home Ec. You can follow any responses to this entry through RSS 2.0. Both comments and pings are currently closed. I have a very similar possibly identical Whirlpool 50 gal electric heater from Lowes. I too have a lifetime warranty. Over the years I’ve replaced this unit a few times. No Mumbai runaround. Since they sell these retail at Lowes it is not actually possible for them to then add a ‘licensed plumber’ restriction to the warranty when you place a claim at least not where I live. Most recently my heater was indeed replaced with a 12 year warranty unit. Whirlpool states the construction is identical to the lifetime model which Lowes no longer stocks. I was instructed to call Whirlpool back once I got the new unit, give them the serial number and they would change the warranty to lifetime on their records. I suggest you give that a try. Thanks for the great info on anode rod maintenance! I too have a lifetime warranty. Over the years I’ve replaced this unit a few times. Now, isn’t that a disturbing fact of life? I just found out my 5o gal electric lifetime Whirlpool WH is leaking at 1:30 AM . I bought it at Lowes which is less than 2 miles away. I don’t know if I can find the receipt do I need it ? My plumber used the flex lines that came with it to hook up the water connections so I am hoping it can be done again without soldering. Is it OK to use till I can get help? It is leaking out the top but not a river if water but all the crap on the floor is wet. I cut the breaker off for the night hoping I can shower in AM. Do you think I can get it changed to lifetime like customer above ? I don’t know if I can find the receipt do I need it ? Without the receipt, I’d say you’re pretty much sunk. Nothing to be lost trying, but don’t get your hopes up. It could be as simple as a loose joint between the flex tubing and the water heater. Try tightening those nuts and see if the situation improves. However, given that it’s been running water into the insulation and over the electrical connections, I think you’re in line for a new water heater anyway.